Tonkatsu, or pork cutlet, is a Japanese dish of pork filet that is breaded with panko breadcrumbs and deep fried. It is traditionally served with a dark savory tonkatsu sauce and shredded green cabbage. Pork tonkatsu is often found on the menus of Japanese restaurants and is also a very popular bento (boxed lunch) item. Pork tonkatsu is also a popular ingredient in katsu donburi (one dish meal of ingredients served over rice) which is tonkatsu served with cooked egg and a savory sweet sauce, all over a bed of rice in a large bowl. 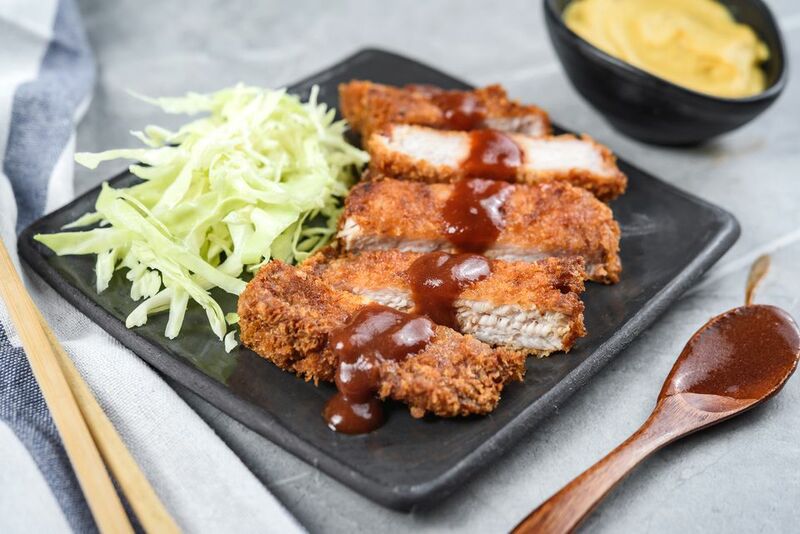 Tonkatsu is served with a savory tonkatsu sauce which is conveniently sold pre-made, in bottles on the shelves of Japanese and other Asian grocery stores. A popular brand of Japanese tonkatsu sauce is known as "Bull Dog Tonkatsu Sauce." It made with a mixture of fruits and vegetables to create a dark and savory sauce that is perfect for tonkatsu. Variations of pork tonkatsu are made with chicken filets instead of pork and known as chicken katsu. Traditionally, pork tonkatsu is served alongside a generous portion of finely shredded green cabbage which is eaten with the tonkatsu. Often, tonkatsu sauce is drizzled on the cabbage as well. Cut the edge of the pork chops in several places. Season with salt and pepper. Set up a breading station with three shallow dishes. Place flour in the first dish, lightly beaten eggs in the second dish, and panko breadcrumbs in the third dish. Coat each pork chop generously with flour, shaking any excess off. Dip the pork into the beaten egg. Coat the pork with panko breadcrumbs and set aside on a platter. In a deep pan, heat canola oil for frying, to around 340 F.
Deep-fry the breaded pork for 5 to 6 minutes. Turn the pork over and fry about 5 more minutes or until cooked through and browned. Remove pork from the oil and drain on paper towels. While the pork is resting, finely shred green cabbage and soak in ice cold water. Drain the shredded cabbage well. Cut each tonkatsu into small, lengthwise pieces and serve on plates with a side of the shredded cabbage. Drizzle some of the tonkatsu sauce over the tonkatsu before eating. Serve karashi (hot Japanese mustard) on the side if you prefer.